Countless albums sit on history’s shelf, but exceedingly few create their own place in time. A place where we can revisit, enriched each time. While I will doubtless miss out on many albums that will carve their places after I am gone, I am fortunate to be alive today to visit the timeless place created by Trophy Wife‘s sophomore effort, Sing What Scares You. Have you ever felt as if language lacked the power and nuance to express a feeling as it sprouted inside you? Like the feeling of spotting a young girl at a charity auction reading a comic strip titled Bizarre Gender-Swapping Girl-venture To Tantalize and Amaze. Like the feeling of being led blindfolded by your lover to pet the pony you’ve always wanted before your sight is returned. Like the feeling of getting your hands on Sing What Scares You directly from Trophy Wife drummer Katy Otto herself at the kickoff show of the band’s tour this past summer. “If you want to,” Katy replied. “I do. I want to. But I must warn you, I am a really slow writer.” I was reminded of Trophy Wife guitarist/vocalist Diane Foglizzo’s words even before I finished the sentence. “I’m feeling the weight of expectations, for which I’m totally responsible,” she wrote regarding her thoughts on making the new record. As I write this, I feel an overwhelming weight. Besides lacking words to adequately sing the album’s praises, I feel as if the review I had promised that hot summer afternoon would constitute my magnum opus. I am consumed with the thought that I will never write anything more important, more dear to the muscle that keeps me alive. In short, I will try my hardest to write a record review and not a love letter. It’s three in the morning and I am lying on a park bench. Mere hours prior, I was at the Cake Shop for my third show in as many nights. I had started in DC two days prior, where I made the fated promise; then secured a ride to Philadelphia; then took an overnight train to the city that doesn’t sleep. Not even the hustle of traffic and bites from insects could keep my body from slumber. But I couldn’t sleep. I was in constant fear. Sleep deprivation is torture of the highest magnitude. I was in enough agony that I begged for death. Yet it’s absolutely the best night of my life and will remain thus forever. To follow the band and witness its journey in cementing their place in history is priceless. The introspective silence that follows embodies the spirit of the record. It conveys a seething anger calmed by the infinite potential of a better tomorrow. I actually loath punk music, even though I appreciate its attitude. 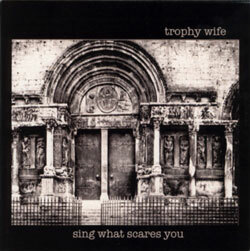 Abrasive notes and incomprehensible screams do not appeal to me and Trophy Wife is as punk as punk does. Yet I’ve easily spun the record five hundred times over the past half year. In agreement with Kathy Cashel of the band Cat Furniture, I can discern the shouted words of Diane and Katy. There is clarity in indignation here. And this is why the record shines above all others in a year full of magnificent releases. How you say something is just as important, if not more so, than what you say. One believes Diane when she utters those words with conviction. Her voice — saccharine, strong and solemn all at once — compels the listener to press repeat again and again. Her timeless, tender and touching delivery invokes hope. Diane’s command of her guitar redefines awe. From the fierce chords in “Boundaries,” where one can hear her bow as she rocks out, to the serene symphonic lullaby in “Warrior,” it’s the intersection between wonder and love. But to discuss Diane without Katy is like having fire without oxygen, the ying without the yang or a future without a dream. Katy’s drumming is magic personified. Restrained by the confines of mathematics, she masterfully gives birth to art. The drums become an extension of Katy. Each contact between woman and instrument releases an eruption of rapt emotion so palpable one can embrace it. And then there’s the duet in “Identifiers”. The two musicians trade phrases in perfect tandem. Their voices intertwine like knowing caresses between lovers. The amalgamation is so enchanting that the listener misses the diminuendo of the guitar and drums until Diane and Katy are almost whispering, luring the listener even closer, closer to the ultimate beauty, to truth. There is no favorite moment one awaits for from start to finish of this album. Every note is breathtakingly precious. The record suffers from only one almost unforgivable oversight. At thirty five minutes and change, it is far too short. Sing What Scares You isn’t just the anthem of punk or even of life. To paraphrase Nietzsche, without it, life would be a mistake. Running late and speeding, Natsumi Tsujimoto attempts to evade the police by lifting her motorcycle over her shoulders and proceeds to climb over a hundred steps up a temple on her first day of work as a cop.